When a colleague and friend retires, what do we do? Make cupcakes of course! 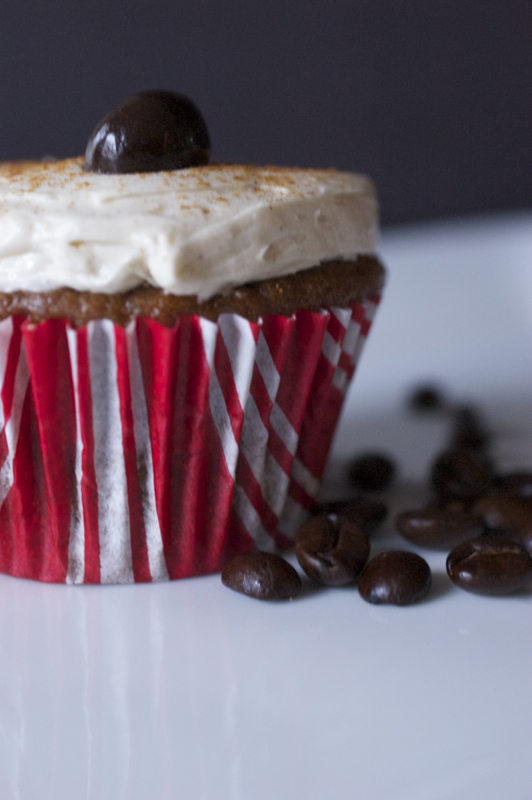 After surveying her favorite flavors and considering the holidays, we decided to create a cupcake that pays homage to a favorite seasonal latte flavor! The cake is moist and has a delightful gingerbread flavor with a hint of coffee. We used a rendition of our favorite European Buttercream to frost the top of these in order to bring across the texture of that delicious latte foam. We used a tablespoon of vanilla and a teaspoon of coffee extract to flavor the buttercream to complement the subtle latte flavors in the cake. We topped each cupcake with a chocolate covered espresso bean and dusted them with a mixture of 1 part ground cinnamon to 3 parts ground ginger. You can also add just a pinch of espresso powder to kick it up a notch, if you desire. These were a hit – and they are perfect for any time of day! Preheat oven to 350°F and prepare cupcake pans with liners. Place all dry ingredients in a stand mixer, mixing on low until combined. Cut butter into chunks and slowly add to dry ingredients, mixing on low until mixture looks like sand. In a separate bowl mix together the milk, sour cream, eggs, and extracts until combined. slowly add half of the milk mixture to the dry mixture, mixing on low and then increasing speed to medium. Mix for about 2 minutes on medium. Decrease speed to low and slowly add remaining milk mixture, scraping sides of bowl, mixing until just combined. Fill cupcake liners ½ full and bake at 350°F for 15-18 minutes or until a toothpick comes out clean.